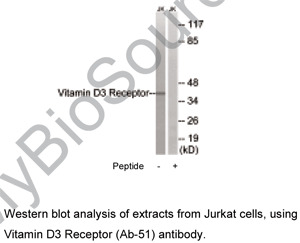 Vitamin D3 Receptor (Ab-51) antibody detects endogenous levels of total Vitamin D3 Receptor protein. The antiserum was produced against synthesized non-phosphopeptide derived from human Vitamin D3 Receptor around the phosphorylation site of serine 51 (R-R-SP-M-K). Small volumes of anti-VDR antibody vial(s) may occasionally become entrapped in the seal of the product vial during shipment and storage. If necessary, briefly centrifuge the vial on a tabletop centrifuge to dislodge any liquid in the container`s cap. Certain products may require to ship with dry ice and additional dry ice fee may apply. NCBI/Uniprot data below describe general gene information for VDR. It may not necessarily be applicable to this product. VDR: Nuclear hormone receptor. Transcription factor that mediates the action of vitamin D3 by controlling the expression of hormone sensitive genes. Regulates transcription of hormone sensitive genes via its association with the WINAC complex, a chromatin-remodeling complex. Recruited to promoters via its interaction with the WINAC complex subunit BAZ1B/WSTF, which mediates the interaction with acetylated histones, an essential step for VDR-promoter association. Plays a central role in calcium homeostasis. Defects in VDR are the cause of rickets vitamin D- dependent type 2A (VDDR2A). A disorder of vitamin D metabolism resulting in severe rickets, hypocalcemia and secondary hyperparathyroidism. Most patients have total alopecia in addition to rickets. Belongs to the nuclear hormone receptor family. NR1 subfamily. 1. Expression of TauT is differentially regulated by Vitamin D(3) and retinoic acid via formation of VDR and RXR complexes in the nuclei in a cell type-dependent manner.